slow roasted pork belly | eat. drink. fly. and pork belly is definitely the new trend. it’s basically the new bacon. meaning that everywhere on a menu that you used to see bacon, it’s now replaced with pork belly. what’s the difference? well, in terms of the meat, not much. but it’s the preparation that makes it different. bacon, essentially is pork belly. but it’s been cured and/or smoked or otherwise prepared. 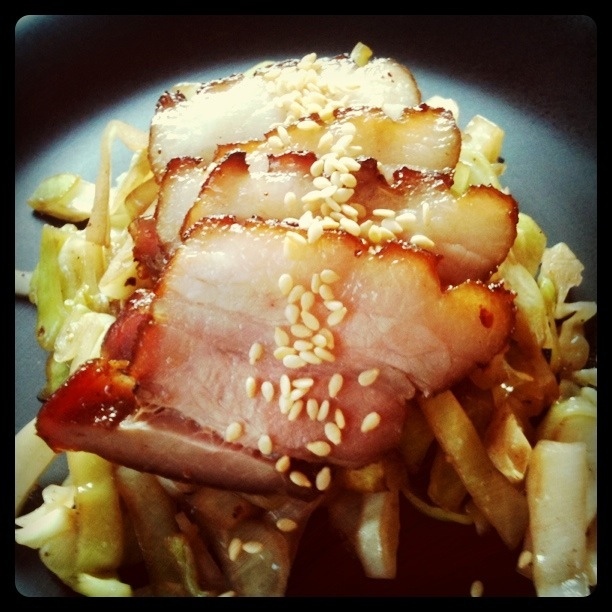 pork belly is the real, raw deal. now, we got our pork belly direct from our butchery class. so i can vouch for it being not only fresh and organic and local and all that good stuff, but my husband actually carved it off the whole pig himself. awesome, non? anyways. we’d been taking ideas for how to prepare this cut. it was something that we’ve eaten, but had not prepared. on our first try, we fried it, expecting it to behave like bacon and render out its fat. it did not. so for round two, we decided to follow the majority of the advice and slow roast it. we started with an asian inspired marinade including soy sauce, sesame oil, a homemade 5-spice and some dark beer. after marinading overnight, we put it in the oven at 200 degrees (basically as low as the oven would go) in a dutch oven to braise in the marinade. after about 2 hours, we checked the progress and it looked done. a quick double check with the meat thermometer confirmed it. plus the smell was making us mental. so we had to eat. we pulled it out and heated up a fry pan on med-high and seared the outside to brown it. we removed it from the pan to rest while we prepared the “bed” for it. into the fry pan goes some shredded green cabbage and some of the marinade/braising liquid too. the flavours from the marinade really turned out to be something special and the cabbage complimented it well. but in all honesty, it was too much fat for me. i trimmed off the top part and discarded it, but i wished i had done that before cooking so that i could have had more marinade contact. my husband, however thought it was perfect as is, so i’d say it’s personal taste. *gush* It looks SO good and almost makes me wish I hadn’t given away all of my pork belly to the Bouviers. Buggery.